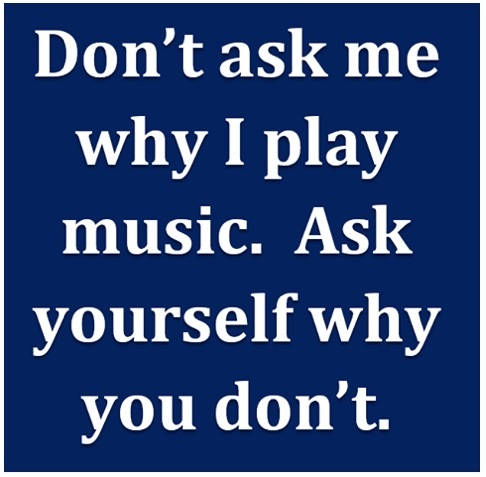 While browsing Facebook yesterday I found an interesting quote, the title of this post “Don’t ask me why I play music. Ask yourself why you don’t”. Doesn’t matter whether it comes from a musician who is worried about his income – the money. Or from a non-musician who is afraid/lazy/ashamed/…, to even consider playing music by him- or herself. It is like saying – if everyone would be eating, then nobody would be growing food and we all would starve to death. It’s a nonsense. An apparent result of the music industry’s broadening the divide between music ‘producers’ and consumers, a.k.a. listeners. I am not implying, that there is a concerted vindictive effort of the industry to do harm. It is a result of the competitive business activity on the side of music industry professionals. It is like the big agribusiness is ‘killing’ small farms. And on the way to the market ‘poisoning’ the food with various chemicals. The counter-reaction is a growing interest in the organic food. Also efforts and ideas to move the food production back closer where it is being consumed – into city or community farms and vertical gardens. On the opposite end of the food production spectrum is the recent development to raise meat in a laboratory. Again a potential danger for the big meat producers. It is obvious, that not all the food could be produced on the spot of consumption. But a lot of healthy vegetables and fruits can and will be. Because it is beneficial for the environment and for the people. Not so much for the “traditional” agribusiness, though. But that is what change brings with itself – the disruption. And the big agriculture industry will have to adjust. Can you imagine a situation in the transportation, where most of the adults would not be driving cars in the North America? Like 99% of the population would became only passive passengers? Dependent and driven by professional drivers in large vehicles? No independent decisions, no individual needs possible. I know, environmentally this would be a blessing. For many adults in the developed world this idea must sound strange though. But what a similarity to the situation in the world of music. And at the sunset of life, with faltering health, they end up driving an electric scooter, a wheelchair. So from a dependent child driving a bicycle, to a dependent elder in a wheelchair. And in between – years of independent activities, ups and downs with responsibility for themselves and others. In music this largest chunk of life doesn’t evolve similar to the driving life. Most of those who get some musical education give up active music making, or musicking, in their early adulthood at the latest. This is often followed with rediscovering music in last stages of life, either through community music ensembles or through music therapy. And in between – some 40 to 50 years of active avoidance of musicking. Because as the commenter from the quoted Facebook post put it – there would be no one to listen to it … ?! Music doesn’t have to be played for somebody else. It’s the best exercise for your brain, after all. And much better if you play with someone. Those farmers, who produce healthy food – they need to eat as well. And those city dwellers, who spend many hours every growing season working in their community gardens, they do it for themselves. To meet and participate with other people, to be closer to the nature, to enjoy results of their effort. Musicking is an individual activity. And it can be very successfully combined with other music makers. Not everyone can and should be satisfied with only the passive listening, and with only music produced for the mass consumption by the music industry. Those riders who use the mass transportation, do it out of necessity or comfort. But as an adult you have many more choices. You can drive your car to work out of necessity – but you can also enjoy car racing. Or you can ride bicycle to the nature for pleasure. You also could go skiing or paragliding and enjoy doing it with other likeminded enthusiasts.